I fully understand the nature of the activities I have chosen to engage in and I find no reason why I am physically or mentally unable to perform the required actions in order to safely accomplish these activities. I am fully aware and understand that the activities in which I am participating in under the arrangement of China Travellers’ employees, agents, and associates are potentially dangerous and that there are risks inherent in all outdoor activities. These risks include but are not limited to hazards in walking, hiking on mountain trails, general outdoor activity, and travel by train or bus. Risks associated with such activities include but are not limited to serious bodily injuries, such as permanent disability, paralysis, and death. There are many risks that may arise from foreseeable or unforeseeable causes (i.e. rocks falling from above and hitting participants below). I understand that these risks may be brought about by my own actions or inactions as well as other participants and staff members of China Travellers actions or inactions. Any decisions made by guides, affiliates or employees of China Travellers are part of the risks of the activities listed above. I also understand that there may be other risks and economic or social losses unseen to me at this time. I fully accept all such risk and responsibilities costs, damages, and losses that may come to me in result of participating in these activities. If you have any medical or psychological conditions, it’s important you let us know well before departure so that we can make extra arrangements if necessary. China Travellers and its guides have the right to disqualify anyone at any time during the trip if they feel the trip member is mentally or physically incapable to continue and/or if a trip member’s continued participation jeopardizes the group’s or his/her own safety. China Travellers is not a medical facility and therefore has no responsibility regarding medical advice, medications or inoculations that you or your doctor deem necessary for your safe participation. Hospital facilities for serious problems are often unavailable, and evacuation can be prolonged, difficult and expensive. China Travellers assumes no liability regarding provision of medical care. By registering for your trip and accepting these Terms and Conditions, you agree to pay for emergency evacuation and emergency medical care. 1. Understand the conditions implied in the Activity Level rating of your selected trip. Select a trip that is appropriate to your interests and abilities. 2. Bring appropriate gear and clothing as advised by China Travellers. 3. Respect the areas in which we travel by using environmentally safe products, staying on established routes of travel and not littering. 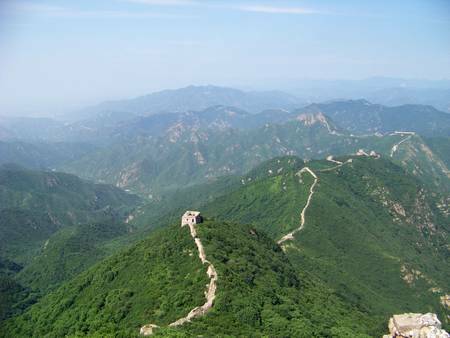 China Travellers reserves the right to decline or to accept any person as a tour participant should such person’s behavior, health or mental condition impede the operation of the trip. China Travellers may contract with independent contractors to provide transportation, guide services and/or all other related travel services. We assume no responsibility, however caused, for injury, loss or damage to person or property in connection with any service provided by an independent contractor or resulting directly from the following: Natural disasters, detention, annoyance, terrorism, thefts, pilferage, force majeure, civil disturbances, government restrictions or regulations, strikes, delays and expenses arising from quarantine, failure of any means of conveyance to arrive or depart as scheduled, discrepancies or change in transit or hotel services over which we have no control. We reserve the right to make reasonable changes in the itinerary where deemed advisable for the comfort and well-being of trip members. 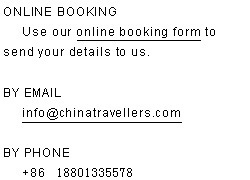 By accepting these Terms and Conditions and registering for this China Travellers trip, the participant agrees to be bound by the above terms and conditions. I release and discharge China Travellers, their owners, staff members, affiliates, agents and employees, and their successors and assigns, from any and all liabilities, suits claims and demand actions or damages (including attorneys fees and disbursement) incurred by me arising out of the participation in activities under the directions of China Travellers including without limitation, all claims for property damage, personal injuries, or wrongful death. This release is binding on my heirs, assigns, and agents. I hereby in the event of an emergency, permission is given for any medical treatment provided by China Travellers’ employees, agents and associates, which might become necessary. I hereby authorize the leader of the activity to secure such medical advice and services as may be necessary for the health and safety of myself, and I consent to release all medical information the leader determines necessary to any medical provider. I also agree to accept financial responsibility for medical treatment. Hospital facilities, qualified medical care, and emergency medical evacuation may be limited or unavailable during portions of the trip and, where available, may be expensive. China Travellers assumes no responsibility for providing medical care during the trip, and I will have to pay for any medical care and/or evacuation that I incur. In consideration of the permission to participate in the Trip, I agree to the terms contained in this document. I hereby agree to indemnify and hold China Travellers harmless for any litigation expenses, attorney fees, loss, liability, damage or cost which any many bring about as a result of such claim, to the fullest extent permitted by the law. This release includes, but is not limited to, claims for the negligence of the Released Parties and claims for strict liability for abnormally dangerous activities. This release does not extend to claims for gross negligence, intentional or reckless misconduct, or any other liabilities that Chinese Law does not permit to be released by agreement. I also agree NOT TO SUE or make a claim against the Released Parties for death, injuries, loss, or harm that occurs on the trip.